I was thinking that I did add some extra stuff to the candles which could be having an impact. I read that rust destroys relationships so I added some and different oils. Just to cover all the bases. LOL! Why on earth are you adding rust to a cut and clear candle? Rust causes relationships to be destroyed alright...it causes them to end through VIOLENCE and WAR. It destroys the relationship because it causes so much strife that they usually physically fight. RUST is one of the main ingredients in war water. RUST=WAR. And adding it to a cut and clear has no purpose, and is definitely not even in line with the same intentions. "Rust causes relationships to be destroyed alright...it causes them to end through VIOLENCE and WAR. It destroys the relationship because it causes so much strife that they usually physically fight." Then why did you place this under the Cut and clear vigil candle section? Did this have anything to do with a cut and clear question? In the future make sure that you post in the correct section. You're making more work for the moderators. I posted my question because I was asking advice about my Cut and Clear candle. I wanted to know if its supposed to burn clear or black. I'm not sure why you think I'm making work for the moderators but I bought a LM product and I'm just asking questions so I understand the trial and error of my work. I do appreciate your advice as well as the others and the moderators help. Thank you! Cut and Clear Candle to Separate BoyFriend from His Ex? I have been working with an AIRR member for a situation with my current relationship. Through a reading I found out that my boyfriend's daughter's mom has been doing some work on him to try and get him back and that is what was causing issues for us. My rootworker stated that she is using him and is causing financial problems for him (more than child support). She also stated that his daughter’s mom is manipulating him by using their daughter (something I had suspected). A moving candle spell was already done to bring us closer together and move her away from us. With my rootworker’s permission, I did a freezer spell on her to help stop her from interfering (I found one that Dr. E posted that I liked and saw improvements quickly). My rootworker also did a hotfoot candle on her and a clarity candle for him as well. Things are much better in our relationship now but I would still like to work on trying to stop her from wanting to be with him, use him, or manipulate him. I have been reading through different threads and was contemplating a cut and clear candle to be set for his daughter’s mom so that hopefully once her emotional ties are cut, they can have a nice civil relationship for the child’s sake. Would this be a good route to take? On a side note, according to the reading she does not genuinely love him but is wanting to be with him for financial support. So with this in mind, would there be emotional ties to be cut from her end? I have a good man who wants to do the right thing but in the process he tends to let her walk all over him. Thanks in advance to you all I love this community and cannot praise it enough! I got a Cut and Clear vigil candle and did the list, cutting, etc. as instructed. However, I was supposed to pray Psalm 23 every day over it and skipped a day. Should I re-do the work and vigil? Thanks! When I have missed just a day, I give my sincere apologies, say the prayer twice, and then on the last day of the spell, pray it twice again. If it doesn't work, then, YES you'll have to re-do it. Hi prayer10, C&C would be a good choice as long as the petition is worded clearly. Adding a Healing light would also complete the work nicely. I burned a candle to cut and clear my ties to my 1st ex-husband and my current but soon-to-be ex husband. We still live with one another, but he claims he doesn't want to stay married anymore. I have feelings for him that I would like to stop having, because due to reasons that would take too long to go into here, we both are not able to move out from each other at the moment- though we are in separate bedrooms. I used cut and clear candle on a black candle- and owl shaped candle, because it was the only black candle I had access to. I live in a remote area where Spiritual supplies are hard to come by, and I wanted to do the spell with the waning phase of the moon. I figured if I ordered from Lucky Mojo it may not have arrived in time. Well I wrote my petition, read it aloud, anointed the candle with the appropriate oil, put petition under the candle, recited my bible verses & lit the candle. I visualized and put lots of energy into the candle. The top of the candle burned, but it went out once it got to the bottom of the head. In fact, the head of the owl didn't so much completely melt as it appears to have "split", with the two sides laying wide open at the sides like the shell of a pistachio. Do you think this has any significance (like maybe, DON'T do this spell), or that the candle was just defective? I have a photo, I just don't know how to upload it here. Generally speaking this is for LM products only. Also you did the spell using what you had, not sure of the significance of an owl in the work but I would look at it of two ways 1. the candle put itself out meaning cut and clear is not happening at this time, which is consistent with what you said because you still live together. Other hand it could be a bad burn because figure candles tend to burn messy regardless and this was the product of environment. I see you cant really do the lighting yourself being in the situation. I would contact an AIRR worker and have them set a cut and clear for you and you to pray daily for 7 days to break the bond, maybe set a small candle . and of course a a spiritual bath. Will a cut& clear candle help me move on from an old relationship? Also will the person for get about me? In my experience after a cut and clear you don't hear from the person again unless there are children or court cases involved. I wouldn't say they would forget about you entirely but it severs all ties with that past relationship. Oh, geez. I'm so very sorry that you're feeling this way. Thanks again,all of you are WONDERFUL!!!!! There is an AIRR member who did a Cut and Clear (for a client) from someone with bad habits. The same person returned without the bad habits and they are very happy together!! So, YES, that can happen!! I've never worked with rust before, how is it used? Can it be sprinkled on a candle for example to cause a violent breakup? Can it be used as a foot track powder? Thank you for your time. I also use it in break up and destruction bottles. Whenever you 're doing a spell for strife, think of rust!! And think of war water!! I have a question regarding if the cut and clear candle is right for my situation, or if I need something else. There is a person somewhat in my life that I have very strong (very close to "love") feelings for. I am pretty sure he feels the same (he actually told me he loved me twice during conversation - I don't even know if he realized he said it), but he is a tough nut to crack, for sure. To use a metaphor, we are in the same book, but not on the same page, and we read at a different pace. I am kind of a fast mover... if I have feelings, I want to act on them, whereas he is more of a very slow mover. We've discussed this difference a few times, and we've tried to date, but it always ends the same. Not necessarily BAD, but we just can't seem to be in sync, though our chemistry is off the charts and we each are what the other person is looking for - we just can't make it happen. I get impatient, he gets frustrated with my impatience... and it ends again. I've asked MISC to burn a couple of attraction candles on my behalf, and he is mentioned in my petition, and he does "show up" (via text - he's been in another state for the last couple of months) here and there. Neither of us can seem to forget the other, nor does the attraction wane. I don't feel like we are finished yet, but in the meantime my heart aches for him. "Hung up" is putting it mildly. My personal feelings on Hoodoo/ any kind of magick work are these: I am all for using it to help things along, but not forcing things that are not supposed to be. My petitions always state what my desired outcome is, but that I only want that outcome if it is good for all involved. I don't want anyone else to suffer just so I may benefit. As I said before, I have zero interest in forcing anyone's hand, just in helping things happen more smoothly and faster if possible. I am lost on what to do in this situation, and if this is not meant to be, I want these feelings I have for him to go away. But what if they're not supposed to go away? If I burn a cut and clear, are we done forever? Am I possibly ruining something that is meant to be, but just not meant to be right now? Is there any kind of "put my feelings on hold until a later date" candle (kidding, I know there isn't)? A road opener was recently burned for me (have not got the report back yet), and we've been in contact - flirty and friendly (but not daily). Do I need to just let things be for a while and wait until he is back home in this state and see what happens? It kills me to have such strong feelings (and he knows I have them) and not have any idea what my next move should be. I don't want to ruin anything, but I also don't want to ache and pine for him like I do. I suppose I should mention he is not "my type" at all. Not at all what I was looking for or thought I wanted, but it turns out he may be exactly what I've been searching for, and I adore him more than I can comfortably deal with. I welcome any and all input, and am hoping someone will say something that resonates with my heart and my instinct will tell me what to do next. This is an IMPOSSIBLE question to answer n the forum. I would avoid the Cut and Clear until you get a reading on this. I thought it might be, but worth a shot, right? I do want to get a reading, but I am unsure how to even proceed with that or what to address - many pieces of my life feel scattered and I am unsure if I should focus on the whole picture or just parts of it. Obviously I need to look into that more before doing it! But I will avoid the Cut and Clear for now. Thank you for that advice... I don't really need to make things even more complicated than they are. And no, he is not married or in a relationship. We're just two people perfect for one another aside from the fact that we are both stubborn and cannot get it together. We can't get past our own hang-ups. It's a stale mate, time and time again. For the situation you describe, you might be better off with a breakup or separation spell. Go the direct route. Since you have a reading coming up, you should defer to the advice of your reader, but this is what I would personally do if someone I care about is in a toxic relationship. Good luck! Of course the person might, but if you do nothing they win. Cut and clear is something you use to cut the past and open up yourself for new love. Your personal oppinion on hoodoo and magic is nice but it is not how magic or hoodoo works. there is no such thing as not forcing it not changing it and letting it be, unless of course you do nothing and let it be. In hoodoo or any other magic you are exerting your will with the power of prayer and the spirits at hand to create change. Change is a choice, it forces one against another. Sure it takes the path of least resistance, but it is still a choice. You said you do not want to force it but will consider break up, thats forcing it by ending his one for another. I think one reason you are seeing iffy results is because your petitions are soft and weak at best. I understand you may not want to do a spell to make him fall in love with you, but in reality if he does not have the inclination to love you or be with you then no spell would work and keep him in that capacity anyway. Try spending more time focusing on what you really want and doing work that addresses those issues. being the complexity of your situation I would get a reading that focuses only on the relationship. I've had Blockbuster and Road Open candles lit on my behave to blast open and clear the way so I may find a suitable partner(once clear planning on Adam and Eve or Come to me Vigils or spell).The results were well however the last Road Opener candle had a ring of wax at the bottom and I know this is due to unresolved past issues. I would like to work some Cut and Clear vigils and want to rid myself of disappointment and rejection I've felt by one particular person that I feel may still be holding me back a little. Problem is I don't want to rid myself of good memories of them and am open to this person just as a friend in the future. When I had a reading with you I was told that they cared about me very much and I was going to hear from them again and our friendship would continue. Can I just rid myself of the past disappointments and specify that in my petition without harming our future friendship?? I am in a good relationship but we keep having issues regarding our past -much worse- relationships.We are happy with one another but when we do bicker-it has to do with "fallout" from an ex(One of us thinking the other might behave in the manner an unsavory ex would,etc.) Would a Cut and Clear vigil help with this,to help our relationship move on from our collective past betrayals? And would there need to be two candles(as we are clearing away two past relationships)or just one as we are already in a relationship-but want to leave our past hurts in the past? I am considering doing a Cut and Clear spell(white & black candle method) for myself and reinforcing his "Cut and Clear" with the vigil.Thoughts? There is an old military expression that says "generals always fight the last war." This means we assume our future battles will involve the same dynamics of past battles so we equip ourselves accordingly, when in fact every new conflict has its own set of issues - different people, different energies, different situations, etc. It's hard to let go of how we handled past hurts and conflicts, and to treat a new relationship as a separate thing requiring a new approach and strategy, but it sounds like this is what you need to do. I would not use Cut and Clear on your current relationship to prepare a better future together - it removes all emotional ties to a person, so doing that here would have an averse impact on your feelings for each other. Instead, you could each separately do a Cut and Clear spell on your respective past relationships that have left you with residual animosity, to remove those ties to people who have betrayed you in the past. I would just avoid doing it on your current relationship. You could also put yourself and your partner in a honey jar and include Balm of Gilead among the herbs you add to it. This helps to smooth over past hurts, including those inflicted by past relationships, so you can maintain a more harmonious and peaceful relationship together. I prefer the idea of doing a positive loving spell to reinforce us as a couple more than focusing in any way on our exes.Keep that mess in the rear view mirror,I say. I guess I just need to stay persistent with my cleansing work,maybe get out my bottle of Hindu Grass oil and add it to the weekly mix. I think a white candle dressed in Healing and maybe Love me/Chuparossa oil burned on a honey jar like you described might be the ticket.Thanks for the insight!!!! That sounds like a good plan. Best of luck to you. Okay, I am interested in performing a Cut and Clear spell and taking a walnut bath, but I read that the Black Walnut bath stains the skin badly, is it true? Then I was told that I can bath with the leaves from the Black Walnuts. Would it be less or the same effective with just the leaves? I am trying to rid myself of a narcissist guy that I really care for but he's no good for me! Sigh recently my boyfriend broke up with me. Since then i have been feeling sad everyday and i cannot get over him. I would like to put in an order to do the walnut bath but i am not in the US and my orders always take 2 months to arrive. I dont think i can wait that long. I am getting depressed with each passing day and i wish i could move on instead of holding on. Can i just have the cut and clear vigil candle lit instead of doing the spell? I really want to forget him and stop feeling for him. Please advise what i can do with nothing on hand. I'm sorry you are feeling so hurt and sad. I'd say that a Cut & Clear vigil would be a great first step, anything to get that ball rolling so you can start to feel better. I'm unsure though if the shop is currently setting lights for people. You should call and ask: 707-887-1521. Hope you all are doing well. I wanted to know about the Cut and Clear spell. I used the spell on My ex a few years ago after we broke up. It worked and I don't care for him anymore but in my new relationship, I am struggling because I have residual feelings and fears that he will do the same things. Before my last relationship I was never worried when I should have been and now that I know I shouldn't be worried I am. Can performing the cut and clear spell again towards the emotions be the best route or do the spell again against my last relationship again? How do I cut away these feelings before I help to ruin this relationship? I have a question about doing a Cut and Clear for two people. Either myself or I will have the Candle Ministry light one. But if I do that I was wondering how I should petition it and would I need the pictures of both individuals? Such as "Person A, you will no longer have feelings for Person B" then provide pictures for both people? Or would I just send them Person As photo?? Cut and clear is more of a personal product used by the person to cut the bad person out, clear the bad out that they no longer want in their life and clear the path for a new lover of the good qualities they do want in a lover. Clarity to make them see a break up is needed, cast off evil if one is a bad influence, break up to end a relationship would be better suited. so this question may have been answered before or at least touched on, so please bare with me. Is a clearing away of any bad memories, confusion, hurt feelings and emotions, that my ex and I may have between us. To cut away any advice/gossip that 2 specific people in his life may have influenced him with as well. We began talking as friends recently after a very long period of no contact seperation. It was going well and friendship is all I really desire at this point but it came to a abrupt end once again. in your experience has cut and clear been used in this manner before? It's the in depth "past" that we have between us that creates hesitation, clarity & reconciliation even as friends just cant seem to be fully reached without the glimmer of hope. 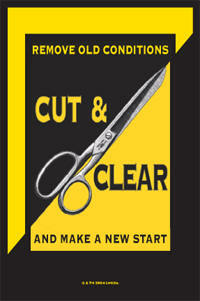 Cut and Clear is not used to clear away past hurts or interference in a relationship, it's to sever all emotional ties. This may be why you are experiencing an abrupt end, since you did work to remove any lingering emotions between you two. I always thought that this is what it was meant for as well. The abrupt ending in communication came before I requested this candle. With the petition to clear away the bad but not the good memories/emotions. Miss Athena explained it very well cut and clear is used to cut the past people out and clear the way for a new lover. In the spell directions it says to list the bad qualities and then burn them and list a list of good qualities you want to keep to find in a new person. If you want to heal past hurts and work on past hurts use reconciliation oil as Miss Athena stated, healing oil to heal past hurts or pain. Balm of gilead bud is used to help clear away past hurts as well and is sold by lucky mojo. Psalms 23 and 32 are read together when trying to reconcile with a lover.